The City of Maricopa is looking for local residents who are interested in participating in a Halloween Decorating contest. 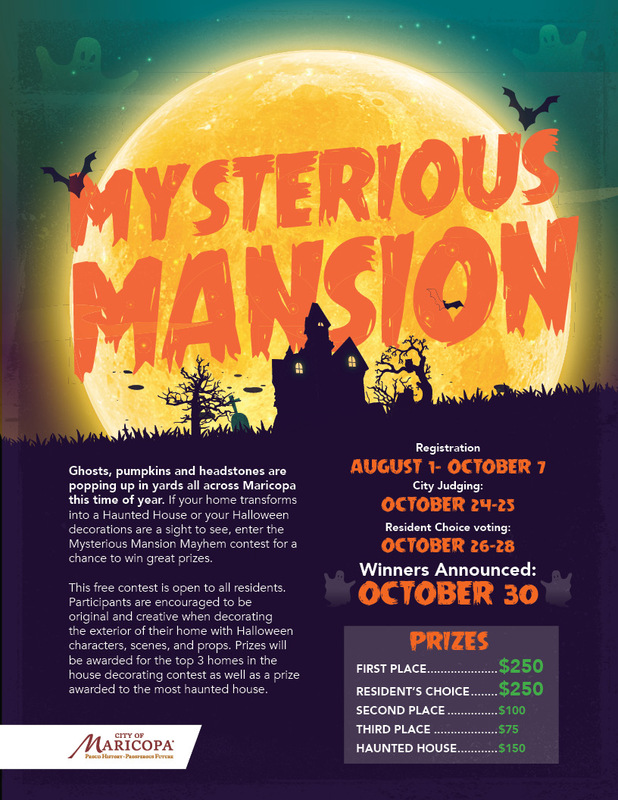 Community members can register their homes at Mysterious Mansion Mayhem Registration Link between August 1- October 7, 2018. Registration deadline is October 7, 2018, at 10:00 pm. There are two ways to win the $250 prize. One is the Community judging category where Resident’s vote online for their favorite home starting at midnight October 26 and ending at midnight on October 28 at 11:59 p.m. Community judging does not include the Haunted House category. The other 1-3 place and Best Haunted House (cash prizes) are awarded by the Parks, Recreation, and Library committee (PRL). The PRL Committee will be out to judge homes October 24 and 25 between the hours of 6-9 p.m. Judges will score based on creativity, theme, lighting and overall execution.